The head of the Veterans Administration is the latest top official around the Trump administration to leave his post. WASHINGTON — President Donald Trump’s sudden firing of Veterans Affairs Secretary David Shulkin and surprise nomination of the White House’s top physician to take his place has raised concerns among lawmakers and veterans groups who worry it will disrupt ongoing efforts to reform the massive federal bureaucracy. Shulkin, who was approved by a 100-0 vote in the Senate about 14 months ago, became the second top VA executive forced out of office in less than four years. Veterans groups and a series of prominent lawmakers had petitioned Trump to keep Shulkin in place in recent weeks, arguing his tenure was mostly characterized by significant, meaningful reforms. But Trump in a series of tweets on Wednesday evening, Trump announced he intended to nominate presidential physician Rear Adm. Ronny Jackson to replace Shulkin, and to move Under Secretary of Defense for Personnel and Readiness Robert Wilkie into the interim leadership post while the transition occurs. Jackson, a 23-year sailor and a respected military physician, is largely an unknown in the veterans community. None of his official biography mentions work with the department, or in veterans issues. He is an Iraq War veteran how deployed as an emergency medicine physician with the Surgical Shock Trauma Platoon in Taqaddum, Iraq, in 2005. 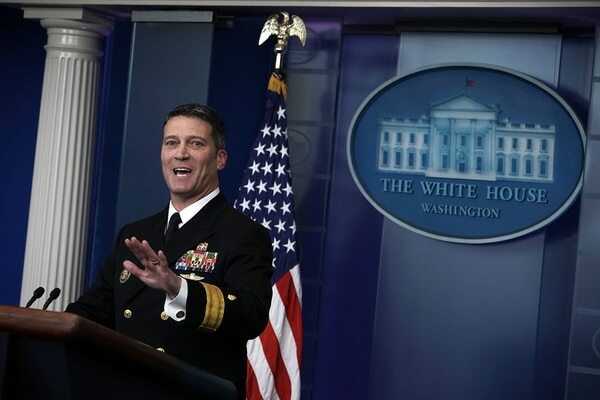 He served as the White House doctor for former presidents George W. Bush and Barack Obama, directing health care for not only the commander-in-chief but their senior staff and Cabinet officials. Shulkin, once seen as among Trump's least controversial Cabinet officials, had drawn criticism in recent weeks for his handling of a travel scandal. He’ll now take over the second-largest federal department, with a staff of more than 360,000 employees who handle health care needs of more than 9 million veterans. Both men are currently working with House and administration officials on an ambitious VA health care overhaul, one that has been entangled in debates of privatization of department responsibilities and how much VA funding should be shifted to private-care options for veterans. Shulkin was seen as a central figure in those discussions, although his positions on the issue lead in part to his dismissal. Sen. Richard Blumenthal, D-Conn., promised serious scrutiny for the new nominee on those issues. Veterans groups also expressed skepticism. “The VA has a broad mission and the secretary must be someone who is imminently qualified to lead the nation’s second largest cabinet agency,” said Carl Blake, executive director of Paralyzed Veterans of America. But Sarah Verardo, executive director of conservative-backed Independence Fund, said the move can help move the department out of its current controversies and refocus leaders on reform efforts. No timeline has been set for confirmation hearings for Jackson. The process typically takes several months, but that could be extended or sped up based on Congress’ shortened legislative schedule this year due to the November mid-term elections.